Ground Penetrating Radar Systems, LLC. 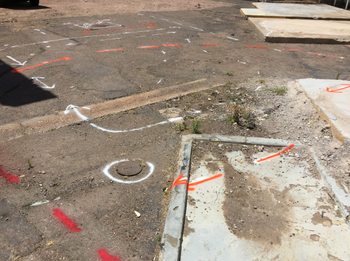 serving the entire state of Arizona as well as nationwide, was contacted by a major commercial contractor to conduct location services of all underground utilities for an upcoming excavation and soil boring project. The excavation area was a commercial manufacturing plant that operated 24 hours a day. It was critical to locate all underground utilities, as any damage to the utilities during soil boring or excavation work could cause catastrophic and costly damage as well as severe interruption and loss of business to the manufacturing plant that these utilities served. Ground Penetrating Radar System's services were ideal on this site as all utilities were located within a few short hours. Findings made it very clear that the area was very congested with many utilities, including water, electrical power / conduit, sewer lines, gas, and fiber optic lines. GPRS' services were essential for providing the necessary information to excavate and conduct soil borings with safety and avoiding costly utility damages. Additionally, Ground Penetrating Radar, or GPR, does not require evacuation of the area as does traditional x-ray concrete imaging. GPR emits no radiation and is completely safe to be near. Traditional x-ray is mostly done after hours whereas GPR can be done during normal business hours. All data findings are marked directly on the surface at the customer’s request for the easiest interpretation of the scanning provided. With GPR, there is no wait for developing film as with traditional x-ray. Only one side of the slab is needed for scanning, thus time and resources are efficiently save and ideal for tight project schedules or unforeseen emergencies. Ground Penetrating Radar is the new way to x-ray!